It is intriguing that taxa are often described from pot-grown plants instead of naturally grown specimens. This is particularly fascinating to think about as one tries to imagine what form a particular plant that we know from a sun-drenched corner of southern Africa might take in a dim and poorly lit greenhouse in the northern hemisphere. Having spent some time trying to emulate the South African climate in London with little or no success, it has become increasingly apparent that particularly some plants of the section Otidia grow into shapes that are very dissimilar to what one sees in nature: often unrecognisable, sometimes distorted and occasionally bizarre (Fig. 1). Fig. 1: P. klinghardtense in a greenhouse and in nature. This species is very difficult to grow if not provided with intensive sunlight and little water. Now, this could go into the annals of history as just another failed horticultural attempt at growing the ungrowable. However, “this section is just a mess for me” would typically be uttered by fellow Otidia growers trying to make sense of the section while attempting to identify a pot-grown plant. The poor growing conditions in London opened my eyes with respect to the taxonomy of this section and pointed to the many possible identification pitfalls. The flowers of many Otidia species are often similar: it would be impossible to tell P. dasyphyllum from P. alternans or even P. carnosum on the basis of the flower characters alone (Fig. 2). However, they are indisputably different species: P. dasyphyllum grows into tight shrubs with short internodes and small leaves, is tuberous and has persistent remains of petioles. P. alternans can have longer internodes and can grow into substantial and untidy shrubs if not grazed, is not tuberous and does not have persistent petioles. Fig. 2: Flowers of P. adriaanii, P. albersii, P. alternans ssp. parviinflorescens, P. carnosum ssp. ferulaceum, P. ceratophyllum (top row), P. crithmifolium, P. dasyphyllum, P. klinghardtense, P. laxum ssp. laxum, P. paniculatum (bottom row), from left to right . Unfortunately (for both professional and amateur botanists), many of these depend on growing conditions. Stems become elongated, pinnation less pronounced, indumentum thinner, tubers absent, peduncles thin and impersistent, pedicels and petals longer etc. This makes it difficult to recognise plants in the wild, if described from greenhouse grown specimens, and equally so, vice versa. Many natural hybrids have been reported, e.g. between P. laxum and P. carnosum , between P. carnosum and P. parviflorum , while hybrids between subspecies are pretty much a given. P. carnosum is a case in point, where the two subspecies carnosum and ferulaceum are well-defined only at the extremes of the distribution of the species as a whole, and intermediate forms exist elsewhere . Subsp. carnosum typically has thicker stems, more succulent leaves with thinner pinnae, and is tuberous – all of these characters can get lost in cultivation. The subspecies of P. parviflorum have not been formally described yet, although the easily recognizable taxa are again only at the extremes of distribution: the thin-stemmed form with large underground main tubers in summer-rainfall Namibia, the thick-stemmed tuber-less form in southern Namibia and northern Namaqualand, the large and round-petalled ones (“rotundipetalum”) in the Richtersveld and the Little Karoo, the tuberous form in southern Namibia, while intermediate forms exist elsewhere, e.g. in the entire region between Garies and Steinkopf – where hybrids with P. carnosum are also possible . Although historically, hybridisation has been seen as a process countering speciation, it increases gene flow and promotes speciation through adaptation. This shows that the process of speciation in the section Otidia is very active . In the greenhouse, there is no end to this promiscuity unless flowers can be protected from chance pollination, e.g. by covering them with gauze or by isolating a plant. Since most otidias flower at similar times, this can be difficult to achieve in a substantial collection. Hybrids occasionally have infertile stamens (Fig. 3), though often they can be pollinated with pollen from other plants, and mislabelled seeds get distributed (perhaps even between botanical gardens) and the confusion escalates. It is possible that P. dasycaule (or P. dasycaulon) is such a hybrid and until a natural population is found, it may well remain a mystery although it has recently been claimed to be a good species based on DNA evidence . The lesson for a greenhouse grower is not to agonize too much when trying to identify an otidia unless the seed came from carefully pollinated flowers from plants of known provenance. Fig. 3: Two natural hybrids of P. laxum descendance with infertile stamens. In cultivation, infertile stamens also often develop due to lack of sunlight during the period of flower formation. This is a particular headache when trying to make sense of historical publications where sometimes only iconotypes exist, or herbarium specimens that were prepared from well-watered plants grown in poorly lit conditions. Publications based on naturally grown specimens may also be difficult to make sense of if one is trying to identify a plant grown in a greenhouse, with elongated stems, large laminas, thin indumentum and large flowers. As an example, P. parviflorum petals have been observed to grow longer than sepals in such conditions – and yet this is the main character of diagnostic value for this species . Very often, otidias are intensively grazed in nature, and need to be pruned in the greenhouse, P. alternans is a typical example. Some otidias develop particularly thin stems in greenhouse culture, especially those with naturally thin stems, such as P. laxum ssp. karooicum. Often, otidias with tuberous roots and thin stems, e.g. P. pacyhpodium grow in cold winter conditions , where the stems would typically die back in winter. The latter species was recently found on Komsberg Pass near Sutherland, one of the coldest places in South Africa (with record low temperatures down to -20 oC), with frequent snowfall at almost any time of year, at least until recently. In such conditions, tuberous species survive easily, as temperatures rise quickly after the sun reappears – while the ground rarely freezes over, stems may well die off in such conditions. However, in greenhouse culture, stems persist and grow to lengths that can hardly develop in nature. P. laxum ssp. karooicum is another tuberous Otidia with short and thin stems. Naturally grown plants have highly succulent, shallowly lobed leaves with red margins, while greenhouse grown plants can lack tubers, have longer and thinner stems, with barely succulent leaves and green margins (Fig. 4). Such specimens were recently described as P. onustifolium , which would make this name synonymous with P. laxum ssp. karooicum. Fig. 4: A plant of what appears to be P. laxum ssp. karooicum in nature (left), with scans of two naturally grown leaves (left of the scale) and of a greenhouse grown leaf (right of the scale). All images are to scale (1 cm). One wonders: if Knuth described P. hermansdorpense on the basis of a greenhouse grown specimen (of which one branch fragment has been designated as the lectotype ), will it ever be possible to find this species in nature? Provided that it was not a hybrid in the first place, does it exist at all? Luckily, one property of a species does not change in greenhouse culture: DNA. Contemporary DNA techniques can work with small samples of DNA from dry herbarium specimens and identify similarities and differences in the genetic information. However, to appreciate the variability of this information, it is necessary that we have several collections at hand. There is still hope for P. hermansdorpense and P. dasycaule, once found in nature again. Trying to identify an otidia using an iconotype can be quite a comical undertaking. Comparing Curtis’s engraving (which is not the iconotype, but serves to make the point) with the shape of a naturally grown P. ceratophyllum one would be entirely forgiven to think that these cannot be the same species (Fig. 5). And yet, if P. ceratophyllum is grown in dimly lit conditions, its stems can grow very thin and upright, not unlike the illustration. Fig 5: Left: a leafless naturally grown P. ceratophyllum (in the front; an Othonna furcata at the back); right: the drawing of what appears to be a greenhouse-grown plant (Curtis’s Botanical Magazine, 1795, Tab. 315). There is a poignant parallel between our ‘otidia challenge’ and early animal illustrations. 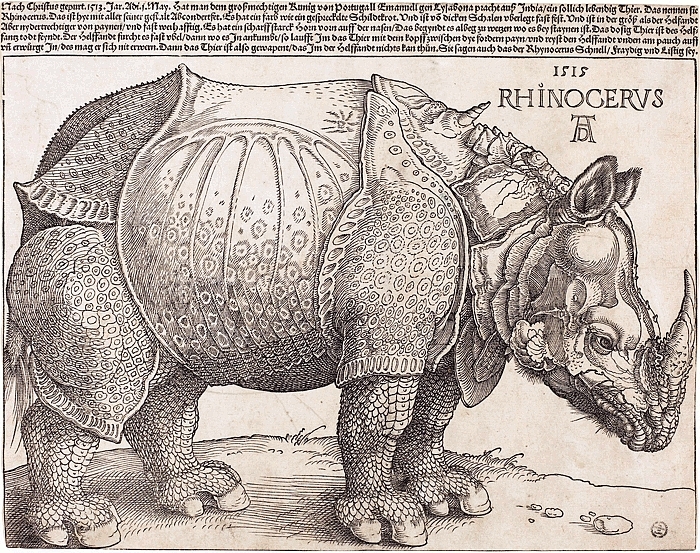 Without ever actually seeing a rhinoceros, Albrecht Dürer executed his famous woodcut in 1515 (Fig. 6). This was drawn on the basis of a description and the sketch of a live animal imported from India to Portugal, and (like in a game of Chinese whispers) Dürer made the spectacularly beautiful drawing of an animal with hard armour-like plates, rivets and an additional horn on its back. While no one can dispute Dürer’s ability as a master of painting and drawing, this clearly isn’t one of an animal that could be found in nature. Fig. 6: Albrecht Dürer: The Rhinoceros, National Gallery of Art (1964.8.697). Public domain. This famous example shows how a specimen can be significantly misdescribed, even by a master draughtsman, if the representation is based on what is assumed to be natural. When identifying a plant on the basis of such assumptions, the question becomes that of which representation is the real one: the plant or its description, like Plato’s dilemma of form and matter. There are many shades of truth between a healthy, stocky natural P. ceratophyllum from the Lüderitz peninsula and Curtis’s representation of it – the challenge for the enthusiast, and perhaps the professional botanist as well, is where in this spectrum is our particular plant. Unusually, the section has had a good share of armchair taxonomists and publications of the düreresque kind. One would wish for more work rooted in proper fieldwork and understanding of plant ecology. Becker M., Albers F. (2009), Taxonomy and phylogeny of two subgroups of Pelargonium section Otidia (Geraniaceae). 1. The Pelargonium carnosum complex. Bothalia 39, 73-85. Becker M, Albers F. (2007), Pelargonium dasycaulon (Geraniaceae) – eine vergessene Art. Kakteen und andere Sukkulenten, 58, 239-240. Becker M., Albers F. (2008), Revision of the ‘P. crithmifolium group’ of Pelargonium section Otidia (Geraniaceae) including the description of the new species P. anauris. Schumannia 5, 169-180. Becker M., Albers F. (2005), Pelargonium adriaanii (Geraniaceae), a new species from the Northern Cape Province, South Africa. Bot. Jahrb. 126:153-161. Abbott R., Albach D., Ansell S., Arntzen J. W., Baird S. J. E., Bierne N., Boughman J., Brelsford A., Buerkle C. A., Buggs R., Butlin R. K., Dieckmann U., Eroukhmanoff F., Grill A., Cahan S. H., Hermasen J. S., Hewitt G., Hudson A. G., Jiggins C., Jones J., Keller B., Marczewski T., Mallet J., Martinez-Rodriguez P., Möst M., Mullen S., Nichols R., Nolte A. W., Parisod C., Pfennig K., Rice A. M., Ritchie M. G., Seifert B., Smadja C. M., Stelkens R., Szymura J. M., Väinölä R., Wolf J. B. W., Zinner D. (2013), Hybridization and speciation. J. Evol. Biol. 2, 229–246. Roux J. P. (2013), Pelargonium pachypodium (section Otidia), a new species from Northern Cape, South Africa. Bothalia 43, 230-233. Clifton R. (2015), Pelargonium section Otidia: diagnosis of the new name P. onustifolium. Geraniaceae Group Associated Notes no. 81, 28-30. Clifton R. (2015), Pelargonium section Otidia: Pelargonium hermansdorpense. Geraniaceae Group Associated Notes no. 81, 23-28. Cite as: M. Strlič: Otidias, or the Story of Dürer’s Rhino, Pelargonium Notes, #4 (2016).